Galactic Qualifiers are epic, high-energy events that celebrate Star Wars™: Destiny and the most enthusiastic members of its global community! 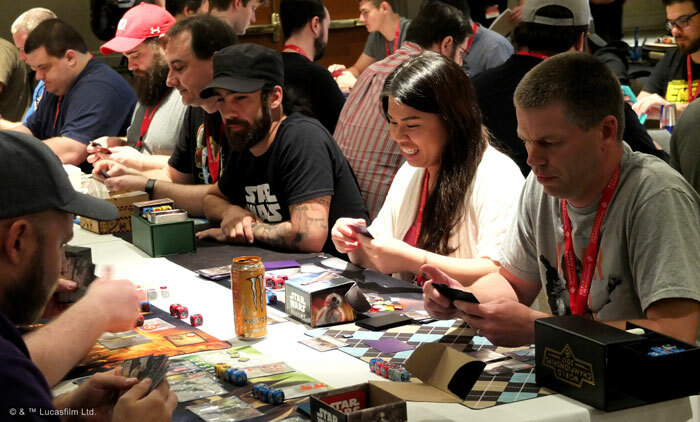 These gatherings are typically held at conventions or similar venues, and they’re designed to welcome players of all skill levels with casual play, top-level competitions, and fantastic prizes! Each Galactic Qualifier event runs multiple days and features two or more Galactic Qualifier tournaments—six-round Swiss tournaments in which players compete for valuable Prize Credits and invitations to the Star Wars: Destiny World Championships. The Prize Credits you receive for competing in the events at a Galactic Qualifier can, in turn, be redeemed at the event's Prize Station for a variety of exclusive, custom Destiny prizes—so that you can walk home with your favorite prizes as long as you earn the Prize Credits to claim them. And you can receive Prize Credits for competing in events other than the main Galactic Qualifiers. While each of your victories in the main event will earn you more Prize Credits, so will your participation and success in the Escape Pod side events taking place throughout the weekend. View the list of Scheduled Events, and make your plans to attend.